This Place of Worship was founded in 1800, but we understand it was closed in 1991. This building is now occupied by 'The Peel Centre', and at the time our photograph was taken, it was hosting an exhibition staged by The Dronfield Camera Club. 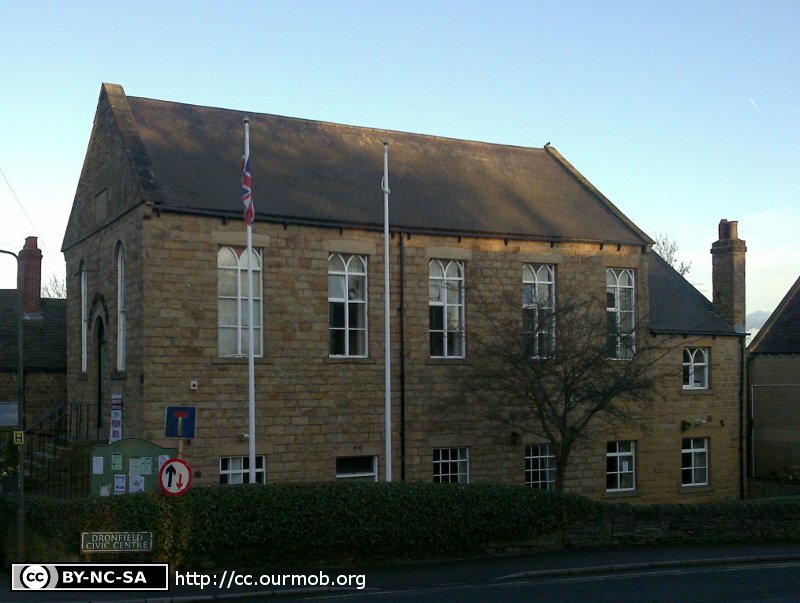 According to their Non-Conformist Register Guide, the Derbyshire Record Office holds registers for "Dronfield UFM Church" of baptisms between 1851 and 1991, and marriages from 1918 to 1990. Today it is Grade II Listed, described by the British Listed Buildings website simply as Dronfield Methodist Church. The plaque set in the gable is inscribed 'United Methodist Free Church 1863'. '1918 to 1990'. Evidently, though, as the DRO hold records of baptisms from 1851, it was preceded by an earlier building. 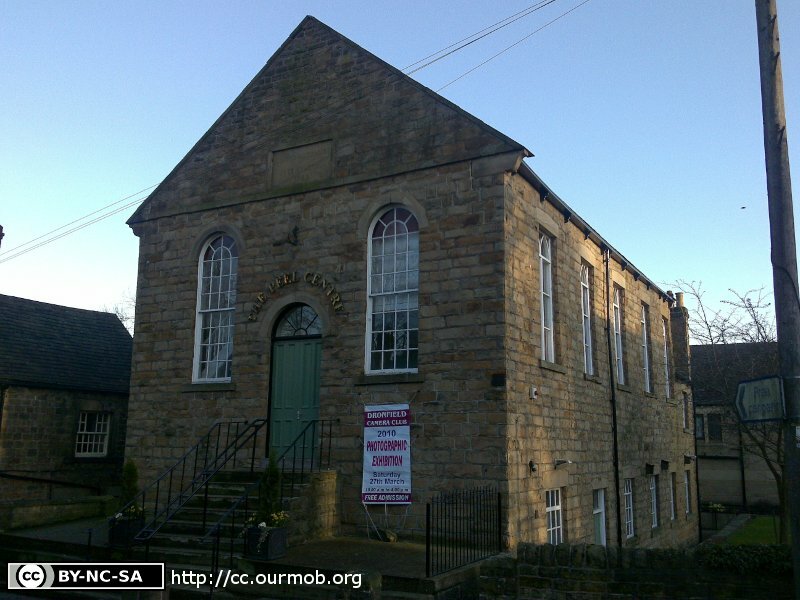 Possibly this was the former "Methodist Chapel", recorded on a return to the Religious Census of 1851 (HO 129/448/5/1/4), built in 1800 for a Wesleyan congregation. It was a separate building, used exclusively as a place of worship "except for a Sunday School" which was 12 yards long by 9 yards wide, and had free sittings for 110 and 54 "other" sittings. Its estimated congregation on March 30th was 43 in the afternoon and 64 in the evening, with 35 Sunday Scholars at a morning class, and 40 in the afternoon. The return was completed by William Booker, Chapel Steward, whose address was "Dronfield, Derbyshire". White's Directory of 1857 also records a Wesleyan Chapel, "erected by the Society of Friends, several years ago" - "a large square handsome building, with galleries [which] will hold about 300". The earliest Old Maps available, of 1877-1882, shows the "Peel Centre" building, but not the Wesleyan Methodist Chapel in Sheffield Road, so it seems reasonable to assume earlier references more closely relate to a building, or buildings in the High Street. A Separate Building, duly certified for religious worship, named METHODIST FREE CHURCH, situated at High-street, Dronfield, in the civil parish of Dronfield, in the county of Derby, in Chesterfield registration district, was, on the 25th day of March, 1915, registered for solemnizing marriages therein, pursuant to 6th and 7th Wm. IV, c.85. Dated 29th March 1915. A corresponding notice of closure was published in the Gazette of 4th November 1991 (p.16795). Dronfield Methodist Church, Dronfield shown on a Google Map. I have found many websites of use whilst compiling the information for this database. Here are some which deserve mention as being of special interest for Dronfield, and perhaps to Local History and Places of Worship as a whole. Information last updated on 16 Dec 2014 at 12:16. This Report was created 18 Apr 2019 - 23:38:54 BST from information held in the Derbyshire section of the Places of Worship Database. This was last updated on 6 Feb 2019 at 15:49.